Bowling Green is a City Manager form of government as constituted under Kentucky Revised Statute 83A.150. All of the power of the executive and legislative branch are vested in the Board of Commissioners (all judicial functions are under the jurisdiction of state government). The Board of Commissioners (Board) appoints a City Manager as the chief administrative officer, whose responsibility is to carry out the decisions of the Board and manage the day-to-day operations of the City. The Commissioners serve two year terms while the Mayor serves a four year term. The Mayor has the statutory responsibility to preside at Board meetings, recommend appointments to designated boards, and is the signatory of authorized documents on behalf of the City. Board of Commissioners meetings occur on the first and third Tuesday of each month at 4:30pm. Proposals for action are placed on the agenda by the City Manager or members of the Board. At the meetings, members of the Board discuss and deliberate items on the agenda, then approve, modify, or reject the proposals by a majority vote. The City Manager then carries out the decisions of the Board. 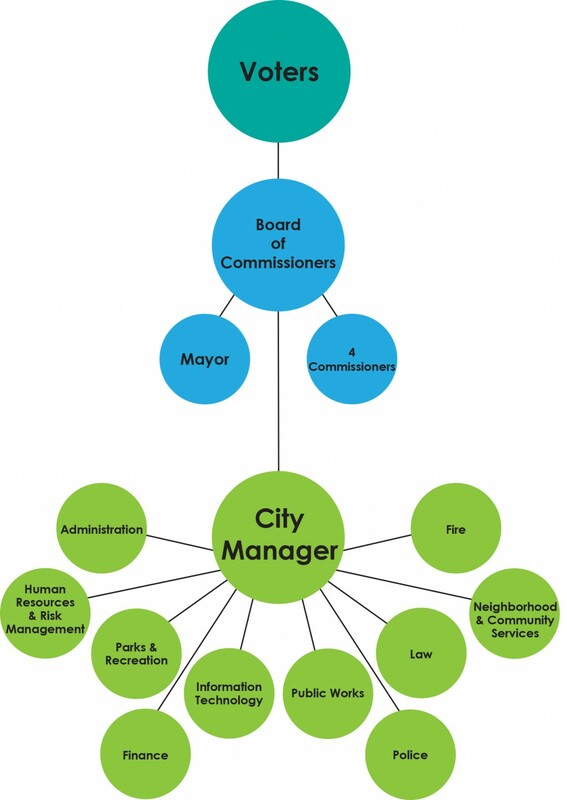 For more information about City government, see information about the Board of Commissioners and the City Manager's Office.